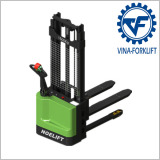 The xe nâng điện mini is designed for use in lifting goods with loads 1000 - 1500kg. With the help of mini forklifts, you will no longer have difficulty moving, loading and unloading goods in tight spaces. - Have a small, beautiful design. The frame is strong, resistant to high strength, super durable. - Just 5 minutes to replace the battery and remove the electronic parts to the outside,making maintenance easier. - Thickness of up to 8mm, ensuring safety during lifting goods. - Vehicle is structured to prevent and prevent dirt. This improves the life of the internal components.